I was 26 years old when we had our first son. Facebook is terribly wonderful for me, as we can look back with such detail. At 5:25am, we were at the hospital, for what wound up being a false alarm. At 12:42pm, we were timing contractions. By 1:52pm, we were back at the hospital. And at 11:10pm, less than an hour before September 1st, Ezra was born. I’ve cried every time I read those words while writing this post this morning. August 31st is always a strange day for me. Our friends Andy and Melissa Mikulak, who are now part of Beat Nb with us, lost their son Max to neuroblastoma less than 2.5 hours before Ezra was born. We love you guys. The day before Ezra’s second birthday is when we found out Ezra had relapsed. And of course, September 1st marks the beginning of Childhood Cancer Awareness Month. So, all the feels right now, every year. I remember singing at church one day not too long after Ezra was born, and sharing a realization I’ve heard from many new fathers since then. The way a father loves a son. The depth that feeling carries. Watching it change my relationship with God. You can explain in words the ache to see your child thrive, the joy in watching them do even the most absolutely normal things, more fully than ever understanding what love is, finding this “I’ll protect you at all costs” feeling which seems as much a part of you as the blood in your veins. But it doesn’t do it justice. You cannot grasp the feeling of being a parent without having a kid. It’s wonderfully exhausting. But he taught me. He taught me to love again, he taught me to live again, he taught me to focus on the amazing little things in life. Like a stick whipping into a pile of leaves or an ant in the crack of a sidewalk. Or watermelon. Vanilla ice cream. He taught me to laugh again, get back in touch with the humanity that I had begun to miss in my life. And then to have it ripped away. It is constant, still, my pain of loss. Sometimes a deep ache, sometimes sharply fresh. But no, these are my feelings. This is the reflection that hits me every year on August 31st, Ezra’s birthday. Robyn and I don’t have a tradition. We’ve tried lots of things – champagne at his grave, happy days, reflective days, sad days. Nothing feels right. And that’s probably fine – it’s not right. We’ve never shied away from recognizing and embracing the pain we carry, understanding it’s a part of us, not the whole. But it is a deep and integral part of us. Sometimes, a thing just hurts. And “that’s the thing about pain – it demands to be felt”. So happy birthday, Ezra. Your mommy said it right – you’re our little life changer. I’d like to share this 5 minute talk I gave at Ignite Tampa Bay, which details some of the work we’ve been funding through Beat Nb to beat childhood cancer through genomics (or precision medicine). Tomorrow is Robyn and I’s ten year wedding anniversary. But I won’t post tomorrow, because I’m shutting my phone off for the week to vacation with her. Always, I am fiercely aware of the families who are, today, in the same place we were when Ezra’s life was a question mark for us. And so, as always (seriously, thank you all for all your support), I’ll mention a way you can help to change our story for another family – I’m $800 short of my $2,500 goal for my first fundraiser under Because of Ezra’s new name (Beat Nb). I’m running 7 miles in Boston with 9,000 other people at Falmouth Road Race. The day I met Robyn, she walked into a Smart Wireless store in the Everett Mall with her mom, wearing a rainbow belt and short hair. Robyn was beautiful, and she was odd, in a way I found maddeningly appealing. I was intrigued. For our first date, we went to The Old Spaghetti Factory, and she was impressed I tipped well. Robyn had lost her dad at 9 to cancer, and her mom, Vivian, had been a waitress most of her life. Now, her mom is my mother in law, and I love her. She keeps it real, although it’s hard for me to see she’s been getting heavily involved in listening to country music lately. Neither of us asked the other out – Robyn handed me her phone when I came to see her the first time after I met her, and on it was her friend Leah who asked me to come on a double date with them. 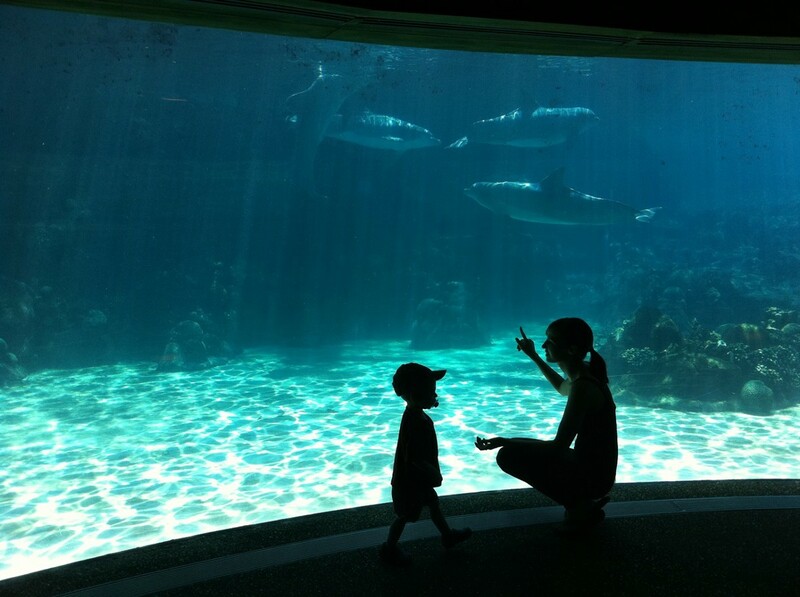 Now, after a decade in different cities, Leah lives in St Pete with her husband Justin and their new baby, Nova. Robyn and I had only known each other a matter of months when I asked her to move to Tampa with me, as I’d already been planning to when I met her, but had called my folks and said “hold on, I met a girl.” She came with me, and moved into an apartment down the street, and I moved back in with my folks for the 4th time, at 23 years old. She happily cried when we were on a boat one day in St Pete and I asked her to be my wife. At our wedding in Marysville shortly after, I played her a song I’d written for her (we’d met some friends in Tampa, but most of our people were still Seattle folk). We got an apartment in Tampa; Ezra’s first home. I was leading worship at Grace Family Church Van Dyke at the time, and through Ezra’s entire cancer diagnosis, treatment, and death, our church family was close and kind to us. We were given three sons, two died in 2010. A fourth came into our home but has since left, although he remains our son. Over the years, we’ve driven across the country, shared meals across the world, met many people we love, and I strongly believe we’ve been a part of saving many children’s lives. There’s a thread that ties tightly to every story I’ve felt these past ten years, and that thread is Robyn. Love is a choice, we’re told. I had no idea what that meant the first time I said the words to her, at the base of the Snoqualmie Waterfalls. I knew I cared for her, and I knew she was a beauty, and I knew this was fun. But I had no idea what it feels like to experience tragedy. I had no idea the loss she would face, holding me tight, the two days I can remember, burned in my mind in perfect clarity as long as I live, as we held our sons and knew they were here no longer. Or the way it feels to break apart, in rushing landslides of loss and in glacial, terrible hurt and question while you try to make since of the thing that has happened. Luckily, I suppose, boredom and monotony have never been our crosses to bear. There is no “fair,” as we know it, and our life hasn’t been “fair.” What has been ripped from my wife is not right, and I have cried nearly as many tears as she has, seeing the way it has broken her. She is mine. I choose to love her, and she me, and it is often easy, and often not. I am selfish and foolish. I am broken. She encourages me when I am doubtful or weary. Sometimes, we have both been unable to hold each other up, and so we only hold on to each other, knowing there is strength found in weakness, knowing God holds us when we can’t hold each other. In the worst times in our minds, at least hoping that’s the case. Outside right now, there’s a Florida summer storm battering down on our home. But inside, I can hear Robyn’s voice echoing as she and Leah laugh. And I feel the pressure on my eyes and blurry edges of vision as tears don’t quite appear, hoping our hearts are the inside of this home and our scarred lion’s skin is the exterior. We have been battered, and we have stood, bowed like a tree to the hurricane in more sense than one. I look at or think of Robyn and smile. I am proud of the woman she is. I am honored to know she’s proud of the man I am. I know her weaknesses, and she knows mine. We have seen our brokenness and chosen to love deeper in those places, pushing bitterness from our minds, chasing away that jaded feeling that gnaws at us the more we learn of the world. Our son is stubborn and joyful, sharing my lighthearted approach to many things, and her fierce tenacity. Robyn feels guilty when she thinks of herself first (although I encourage her, and help, to create space where that’s precisely what she does). She is rare, and beautiful, and a bit scary, and I am drawn to her now more than I ever have been. 10 years is a beginning. I love you Robyn Matthews – let’s do some more. I haven’t written as much lately. We’ve had a shaky last 18 months, and I’ve felt… well, unrested. But not in an “I’m really tired” way. It’s been more of an anxiousness. When I was a teenager and in my early 20s, I had this misplaced pride in the “fact” I never got stressed. Of course it wasn’t true, but as I look back at it, there was something to it. I had an average middle class set of issues, and of course I felt them all with the depth a young musician does. Since I was 15 years old, though, I’ve rested in my faith in God. Circumstances sometimes sucked, but I believed, deeply, I was loved by God. At the core of me, I knew joy and peace. And I grew up, and my sons died. Two of them, in one year, 2010. I married a beautiful and ferociously caring woman, I watched her find herself as a mother, and I watched that ripped from her hands while neither of us could do a thing about it. So my questions got bigger and scarier, and affected who I was in a deeper way. For a couple years, I just drifted, I think stunned that this had happened. Charley was hooked up to a bunch of tubes for the first year of his life, and it was hard for me to connect to him emotionally even the year after that. I never lost my anchor of this core thought of God being real, and us all being loved by Him, personally, including me. I’m sure the line attaching me to that anchor grew taut, though, as I floated around. An anchored boat can still drift; just not as far. The last 18 months. We’d gotten to a point we were starting to feel we could be happy again, and we were excited, in 2013 and 2014. We adopted Charles, and he joined us in October of 2014. But it was a mess. Charles had a hard and unfair life. And a lot of that came out when he was in our home, and not in a therapeutic, “let’s work out our crap” kind of way. It tore all of us up even more, and neither Charles nor ourselves ever felt peace at home. Since June of last year, he’s been in a residential treatment facility. I talk to him often, and visited him recently. Getting to the point where Charles left was hell on all of us. Home wasn’t peaceful. It was tense, dangerous, and we were all dialed to 11 all the time. Making the decision to have Charles move where he is now was hard, but absolutely the right decision. There was some PTSD involved there, and we were… shaky. Shaken? Our foundation felt less strong, and we were tired. Through that, we started a new business, which didn’t really go in the direction we hoped. Life felt shaky. People told us we were strong, heroes, inspirational, but we were broken and hurting. I noticed both Robyn and I were constantly anxious and tense. Because we were so physically consumed by everything going on, we felt we’d lost much of our community. To today. Or, this week. I’ve been thinking about that confidence I felt as a younger man, in God’s love. The rest I felt in knowing that. In Matthew 11:28, we’re told “Come to me, all you who are weary and burdened, and I will give you rest.” I read a great talk by Charles Spurgeon on this passage. He mentions this rest is a rest of many things – rest of the conscience, rest of the heart, rest of the soul, rest of the entire being. I’d forgotten this, or at least I’d left that rest. I’d allowed the core of me to be unrested, and I don’t mean in the positive way that drives you to change terrible or unjust things. I mean in the way that makes you feel unsure of your direction, of whether the heart of it all is good, and of whether the point of it all carries worth. I wrote the song below in 2008, with some help from Larry Wiezycki. This week, I’ve been listening to it and working to restore a core of rest. I still am incensed by injustice – I hope more now than ever before. I am even more passionate about the work we are doing, and driven to push it further and faster. But I used to do all that centered in peace, sure of my direction, precise and driven. I’m re-building that. Today, I found a video from shortly after Ezra died, of me singing at church with a vulnerable and long intro at the beginning. It’s below. I’d encourage you to watch it, at least the talk. I meant the words I said, of God being our strength and joy. Of finding rest in the fact He calls us sons and daughters. There’s a lot of peace there as you research it. I don’t understand why my sons died. I don’t understand why my wife must carry that, in a way even deeper than I do. Or why our fourth son is forced to carry the weight he does, and the effects it had on all of us. But I want to remain in that peace that I had for so long, and I need to say that. I need to put time into it, and I need to point my family to that same place. I am more skeptical of so much now that I have seen more of the tragedy in the world, and how terribly all of us broken people treat each other. But I’d like to be less jaded. I’d like to keep seeing that you’re just like me, wanting peace and rest, and wanting to stand against anything that takes those away from anyone. I’d like to be more genuine and dogged in my search of God’s heart. I’d like to be more intentional again about building our community. None of this is good without caring, passionate people around you. And I think, like the Great Gatsby, I’d like to be known as the single most hopeful person you’ve ever met. I’m tired of anything else. We had a powerful start to the week. We had some new friends in town shooting film footage of our story. It was therapeutic for Robyn and I. Usually, when we talk about Ezra, it’s details: born 2008, diagnosed with neuroblastoma at 400 days old in 2009. 13 months of treatment. Surgery, chemo, etc. Died November 8th, 2010. These past couple days though, we explored how it felt. The “dangerously numb” feeling after he died. The lack of caring for self during treatment, while we poured into Ezra, Price, and Charley. The years of sleeping pills, too much whiskey and bitters, wondering if we were “ok,” and what that even meant for us. It was honest to the point of being nerve-wracking, and refreshing. I know how people WANT us to feel, and too often I mold my words to wrap a bow on our story. I do a disservice to anyone who is genuinely trying to understand how these past seven years have been for us if I fail to explore the pain and grief as much as the amazing things that have happened in spite of and through our losses. Our losses have reshaped who we are. We will never say “everything happens for a reason,” as I could never justify saying Ezra needed to die in order for the good we’ve done since then to come about. I do know you choose what you do when your world falls apart, and I am proud of Robyn and myself, and all those who’ve helped us, for what we’ve done since then. The footage we shot these past couple days may take a while to come to you, but I hope when it does, it means something. And for anyone who carries loss in their bones as we do, our love to you. Thanks for coming over, Reed Morano and Dani Girdwood. My wife Robyn and I’s first born son Ezra died in 2010. He had been diagnosed with cancer on the 400th day of his life, and lived exactly 800 days. Ezra battled cancer half his life. He smiled through most of it. He was funny, curious, and compassionate. He flirted with strangers. He learned to walk and to talk in hospitals. We learned a lot from Ezra, like you can dance and laugh through cancer. We learned the pain from some losses never goes away; it just moves from your skin to your bones. We learned childhood cancer is not yet beaten, and that incredible, strong, fragile families are also learning this every day. Five years ago — a month after Ezra died — Robyn and I started Because of Ezra, a 501(c)(3) non-profit with a goal of finding and funding a cure for neuroblastoma and other childhood cancers. It has grown, giving over $700,000 to support patient-affecting childhood cancer research, including the first ever national clinical study approved for all incurable childhood cancers, and trials of a drug called DFMO which we hope is stopping relapse (over half of kids who beat neuroblastoma relapse — and there is no currently known cure for relapsed neuroblastoma). The results are promising. As I’ve spent these 6 years living in the childhood cancer world, meeting the families and children, the researchers and clinicians… I’ve fallen terribly in love. Childhood cancer is a crushing, inspiring world to live in. Daily, we are reminded of Ezra and our loss, and simultaneously built up as we meet more and more families battling and beating neuroblastoma. We are blanketed in loss, knit together by strength people should never have to know they own, and we stand at the front of a war, trumpeting a battle cry. 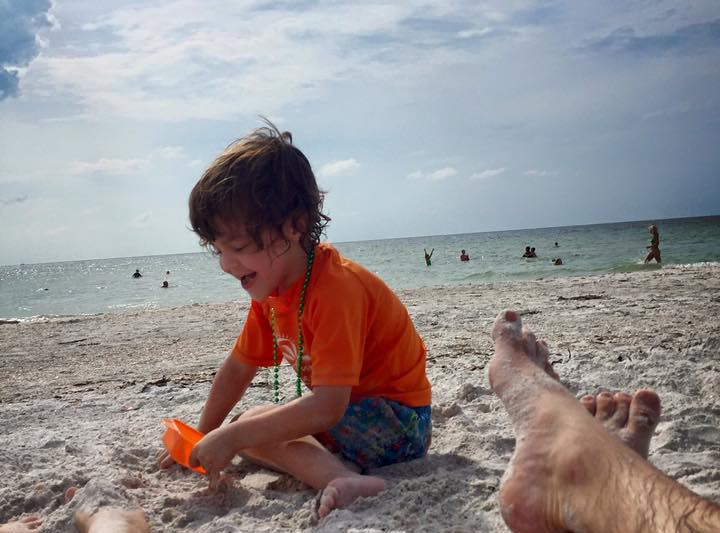 I’ve loved technology since I was young, and have had a ton of fun (and some success) building companies in that space, but my heart was being pulled strongly toward continuing Ezra’s fight, and that of so many other kids we’ve met since he died. I spent 2015 wrestling with the thought of going full time with Because of Ezra. I had the conversation with Robyn many times, and a few people I respect in the childhood cancer world. And so, starting the first week of 2016, I am. I have resigned my position as CTO of Laicos, giving it to our talented Senior Architect Yeng Yang. I will remain a board member and advisor in Laicos, which my co-founder Ryan Negri will continue to run. Beating childhood cancer is my main goal now. And, surrounded by a powerful group of parents, kids, advocates, supporters, scientists, and clinical doctors, we will achieve this goal. Because of Ezra has massive plans. We are working with the NMTRC and Dell on funding and advancing promising personalized medicine research. We are funding and pushing forward a drug called DFMO with very few side effects, which we hope is stopping relapse in kids with neuroblastoma. We pay attention to the entire neuroblastoma research landscape, and maintain relationships with other passionate groups who are doing our type of work. We are beating childhood cancer. 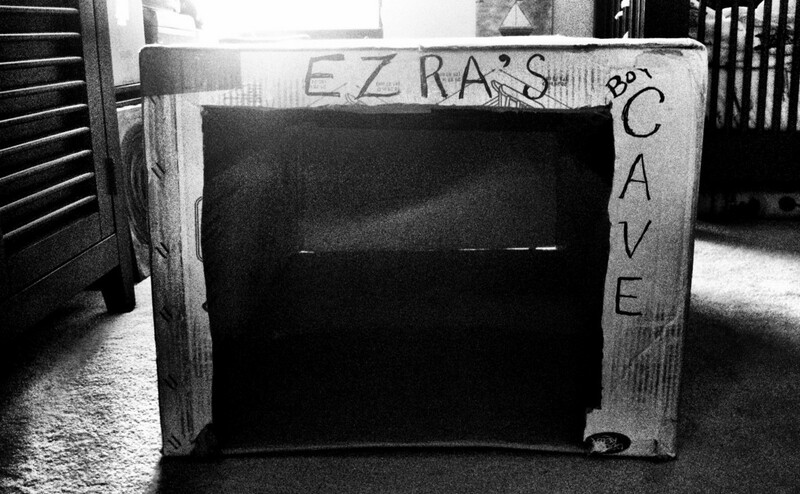 Robyn told me, when proofing this post, Ezra was all the parts of me she loved. To know his name has some small attachment to the work we’re doing, affecting so many kids who are fighting childhood cancer now… it’s a bittersweet feeling. And really, though we started this because of Ezra, we continue it because of so very many children. Our Because of _____ program recognizes we fight in many more names than Ezra’s. I’d love your help. We’ve built an incredible network with Because of Ezra and the many people involved in furthering our mission. As I dive full time into this, we’ll need even more help to make our goals a reality. Please, reach out to me at kyle@becauseofezra.org to partner with us. We have big, audacious things we’d like to do — and the right support and partners will make them happen. Whether you’re a parent needing to connect to someone or know what treatments are available, or maybe wanting to partner with us through our Because of _____ program, or a corporate partner looking for an impactful charity to align with, or a volunteer wanting to help… there are many opportunities, and we need your help. Let’s continue to be an ever-growing fist in the face of childhood cancer. ↑ Ezra. For more of his story, read becauseofezra.org/why. If you’d like to be a part of the work being done to cure childhood cancer, we welcome your involvement. If you are a parent seeking information on clinical trials we help to fund (or anyone with a comment), you can reach us at becauseofezra.org/contact. You can support Because of Ezra financially at becauseofezra.org/give. Because of Ezra, Inc is a 501(c)(3) tax-exempt organization with the Internal Revenue Service. Our EIN is 27–4013571. This article was originally published on my personal blog. Five years ago, my son died of cancer. Our son. I write every year on November 8th… one year without Ezra… two years…. three years… four years… and today is five years. I sat in a bar in Grand Rapids a few months ago with Pat Lacey, who is one of my great friends beating neuroblastoma with us. His son Will Lacey has, basically, chronic cancer. It’s not growing; it’s not going. We had spent all that Saturday afternoon (and wound up spending most of Sunday) in a hospital conference room with a handful of doctors and researchers discussing childhood cancer research, and drafting a new trial. Pat and I talked about how nothing seemed as important as working toward a cure for neuroblastoma. As the September air fogged the windows of that Michigan taphouse, we knew this was what we’d be doing until there was no longer a need. Nothing fills me with that “rightness of action” feeling like what we’re doing through Because of Ezra. Through the NMTRC, Beat NB, and the team we are a part of. A team of families we are surrounded by, fighting childhood cancer, like Sofia‘s. Or Rea‘s. And other passionate people fighting childhood cancer, not always because of Ezra, but because of someone. Robyn’s said it about herself, and I echo her: this is how I continue to be Ezra’s dad. I am broken, a mountain moved onto my chest, an unshakable feeling scratching at my mind that something is missing, something went wrong. Ezra was a laugher, a constant smile. His head be-bopped when music was playing. I wish I’d have been able to know him as a man. I know he’d have been a good one. It’s been over 6 years since he was diagnosed, 5 years since he died. I look at pictures to spark my memories, and watch videos. I have certain moments that play on repeat over and over again in my head. Ezra riding around on his bike in silence. Ezra’s hands covered in dirt as he plays in the yard. My Timehop app showed me photos from a year ago this week, and I thought “huh? that was only a couple months ago” – a year is so little. But a year is all we had of Ezra without cancer, and a year with. One year of him walking. One year of conversation. Charley is 5 now, and he keeps getting cooler. I wish he had a big brother showing him the ropes. I wish I knew a 5 year old Ezra. Or 7, as he’d have been now. We didn’t go to Ezra’s grave today. Not a day goes by that I don’t think of Ezra, miss him, but we have been to his grave less than a dozen times since he died. 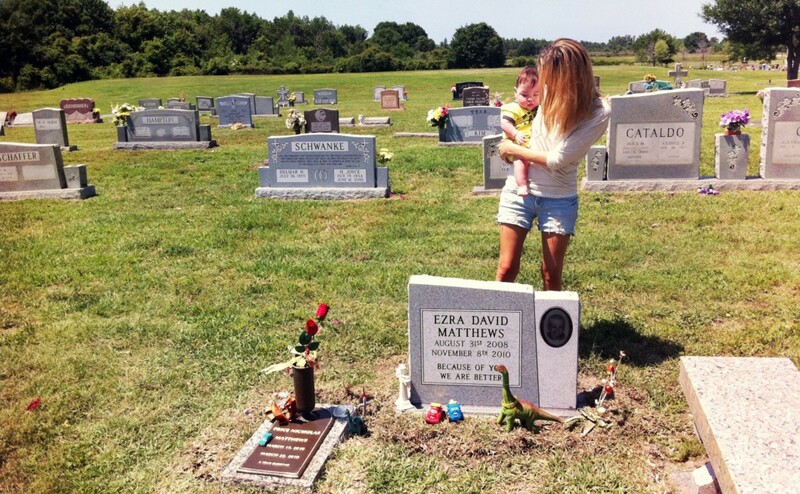 They call headstones “markers.” I think, I hope, our life is a marker for Ezra’s life. I asked Robyn what she wanted to do today, and she said she wanted a cat. I laughed it off, and we cleaned up the house a little. But the more I thought about it, the more I liked her idea (this happens often). Today, we got a cat. She only has one eye. We named her Penny. We brought Penny home, to a house Ezra never knew, and set her up. She’s been hiding under the couch for the last 90 minutes. But I know she’ll come out soon enough, and we’ll get to know her. That’s what we’re doing today. Why would a loving God let my children die? Recently, I received an email from someone teaching an apologetics course at her church. Because you have dealt with so much tragedy in your life and are involved with other people who are going through tough times with their children, I need your help in answering this question from a Christian perspective. I understand if you can’t answer this. It is definitely a difficult question. Some background — in 2010, Robyn and I lost two sons. Price died in March at 1 week old, from complications of being born premature (26 weeks). His twin Charley is 5 now and requires extra care over a typical 5 year old, and is magic. Eight months after Price died, our first-born Ezra died from neuroblastoma cancer. He’d been diagnosed only a couple days before we found out Robyn was pregnant with the twins. The question of why God would let my two sons die has been central to my spiritual life these past 5 years. I spent my later teen years and early 20s leading worship at churches in Seattle, came to Tampa doing the same in 2005, and Robyn and I buried our first two sons here in 2010. I did not grow up in church, but have been falling in love with God since I was 15. Did God let my children die? I find it necessary to think on this before I can even look at “why.” “Let” can mean both “allow” or “cause,” and those two meanings have worlds of distinction. Did God allow my children to die is a different question than did God cause my children to die. It’s not just semantics — “allow” means something else caused this to happen, and God for some reason chose not to heal or change it. “Cause” means God gaveEzra cancer, and caused Price to be born so early — to die at one week old. I believe those are the only two options — allow or cause. I believe God is real, and He is omnipotent, omniscient, and omnipresent. He had the power to change both outcomes (and stories along the way). He had always known Robyn’s and my sons were going to die (and when). He was present the entire time. It wasn’t a case of God forgetting, or being busy elsewhere, or not knowing, or it being too big of a thing. God either DID this — killed my two sons — or He allowed it to happen by not intervening. I believe it was the second of the two. This week, I was reading A. W. Tozer’s book The Knowledge of the Holy. I’d been letting the topic of this post kick around in my mind, and was surprised and excited when Tozer began to address a similar point in his book. If God is sovereign — all powerful, all knowing, and free — how do things like evil, pain, and death exist in the world? Did God create them? Why does He not abolish them? I encourage you to read Chapter 22 of Tozer’s book, “The Sovereignty of God,” as he writes well on this topic. While a complete explanation of the origin of sin eludes us, there are a few things we do know. In His sovereign wisdom God has permitted evil to exist in carefully restricted areas of His creation, a kind of fugitive outlaw whose activities are temporary and limited in scope. In doing this God has acted according to His infinite wisdom and goodness. More than that no one knows at present; and more than that no one needs to know. The name of God is sufficient guarantee of the perfection of His works. I land on the same conclusion. God knew of all the issues with our sons, and always knew. For reasons I cannot know, He chose not to heal them, although He could have. As Jacob wrestled with God (Genesis 32:22–32), so I have spent much time shunning, shouting at, and doubting God since October 4th 2009, the day Ezra was diagnosed with the stage 4 neuroblastoma cancer that 400 days later took his life. I have also spent time wrapped up in His mercy and love, recognizing if I could give explanation to every action or inaction of God, He wouldn’t be God. As a prideful, broken, intelligent man, this brings me as much unrest as it gives me peace. Originally, I planned to write a much longer post on this question. Instead, I will keep it short, and let other thoughts come later. I still believe God is everything I knew He was before. Holy. Just. Merciful. Good. Sovereign. Wise. If you’ve spent any time in church, you may be saying, as I have heard, “But this is an easy answer! When Adam and Eve sinned, sin entered the world, and that is the source of cancer, and sickness, and natural disasters, and all these things we wonder how could happen if God is truly good. Sin and Satan have temporary and partial reign on earth until God casts them away.” This is wonderful logic on how these things can happen, but it doesn’t answer the larger question; why do these things exist at all? Why must we wait on God eliminating them? Why is “no more death, neither sorrow, nor crying, neither shall there be any more pain” (Revelation 21:4) delayed? What justifies this reign of struggle and sin on earth today? Why did Robyn’s and my sons die, along with so many other sons and daughters? I have no answer. I have felt God’s presence, and know He is real. I have faith He is God, and I rest in this knowledge. I hope in my life I can have a greater understanding of why death and pain continue. I hope I can feel more peace than unrest. When I think on the vastness of who God is, logically I find no other response than worship and adoration, and I am humbled in admitting my hurt, my loss, and a foolish pride often keep me from these responses. I am frustrated how difficult this is for me. You, reading this, may struggle with similar thoughts, and perhaps hoped I would offer clarity. I wish I had better words to put ease in your mind. Until then, I will keep searching the heart of God. We have absolutely been honored to have so much support this year in our Karaoke for the Kure events, both in LA (August 17th), and Tampa (Sept 26th). Over $125,000 was raised for childhood cancer research in LA, and over $93,000 in Tampa. In Tampa, 7 families who’ve personally fought or are fighting childhood cancer showed up, illuniating why we’ve started our Because of _____ program. We started Because of Ezra, well, because of Ezra, but we’re still pushing now because of so many kids and families. Over 400 people showed up in Los Angeles, most of whom Robyn or I didn’t know, which makes us proud. We are sharing the stories people need to hear, and we are working to get people on board with this mission of curing childhood cancer. We are beyond grateful to United Talent Agency and Marissa & Matt, Erica and Brad, and all our friends in LA who made the LA event a success, again. One of my favorite moments, and one of the hardest, was singing at Tampa’s event. Robyn asked me a couple weeks before the event if I would sing “Fix You” by Coldplay, and my initial reaction was “no way.” It’s a sad song, but beautiful, and I didn’t think it fit (nor that I could get through the song). But, as is usually the case, she was right – it fit perfectly into the evening, and we covered the screen behind me with kids we’ve met over these past 5 years as the song played. Because of Ezra continues to grow, and I feel like I’m using the words “proud,” “honored,” and “humbled” constantly, but I experience those things daily. Robyn and I, Noelle Muniz now as well (our new Assistant Director for BoE), and all you supporting BoE, are little pieces of a giant group of people doing things just like us, and genius researchers and passionate physicians and clinicians all pouring their hearts into making it so, as Dr Giselle Sholler said this weekend, “we never have to tell a parent again, ‘your child is incurable. '” It makes a difference. Love you all. I’ll make it a point to write here more often, and not just on big occasions, as I know we’ve been slacking a bit. Ezra would have been seven years old today. Happy birthday, son. It is terrible and beautiful that Ezra’s birthday falls on the day before childhood cancer awareness month, September. Every year since forming Because of Ezra, we gear up for September for months, and then just before it starts, our lives get the wind knocked out of them today. Robyn and I were in Philadelphia this week discussing childhood cancer research with an amazing group of people who are leading the charge in childhood cancer advocacy. It was humbling and exciting. We sat in the hotel room one afternoon, and broke down in tears when a video of Ezra came up on Robyn’s Timehop app. It’s at the bottom of this post. We cried together for a while. It isn’t fair. There’s no happy bow on losing a kid to cancer, and there’s no real explanation. It’s just a terrible thing that happens, and we live with that tear in our heart. That day in Philly we sat on the bed, talking about how he was so much like me, always hopeful and smiling, easy for Robyn. How he had my lips. We remembered how he used to dance around all the time, and we wondered it’d have been like to have him here, now, a 7 year old. What would be different. We miss Ezra. Some days my memories of him are less clear than my memories of the moments we have on video or pictures, and that’s scary. It’s weird and sad to think when I listen to his voice, I’m a little surprised not to hear Charley’s, which I’m so used to now. That I have to watch a video to remember Ezra’s voice sometimes. I hate that. I feel like I should be able to cement it all clearly in my memory for full recall at any time, just by some force of willpower. I’m angry that it doesn’t always work. The other day, we met the family of a little girl named Sofia. 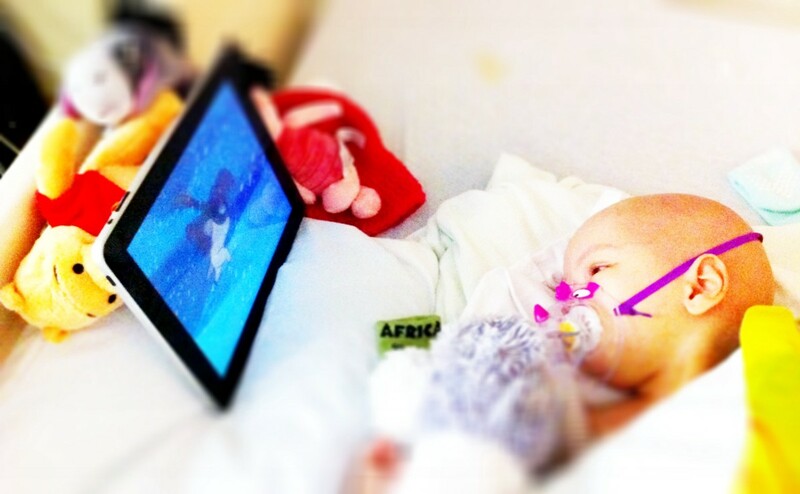 Sofia is being treated at All Children’s. This weekend we shared a meal and a day with them at their home in St Pete, and watched Charley and Sofia run around their living room and pool, with Sofia’s older brother Aiden. We talked about the way priorities shift when cancer slams into your family through your child. We talked about how trivial the things we used to worry about seem, and how open our eyes feel to this scary new world of need; how we never even realized childhood cancer was, as it seems once you’ve been touched by it, everywhere. We talked about how we are beating it. Robyn and I are proud we’re able to help bring trials and more treatment options here, so families don’t have to travel, often spending time with only one parent around. We’ll be celebrating Ezra’s birthday by remembering his smile and laugh, and by knowing we are making a difference still, in his name. Happy birthday, Ezra. Your mom and I love you, and miss you.